The Youm7 [Seventh Day] Newspaper reported on Monday, February 4, 2019, the signing of the Grand Sheikh of Al-Azhar and Vatican Pope of the brotherhood of humanity [human fraternity] document, which constitute (as they claim) the most important document in the history of the relationship between Al-Azhar and the Vatican, and is one of the most important documents in the history of the relationship between Islam and Christianity. The document bears their vision of what should be the relationship between the followers of religions and the status and role that should be played by religions in our world today. It also provided the full text of the document, for which each item needs a detailed response to the fallacies and the Shari’ offences it contains; it is in fact a document that has absolutely no relation to Islam. There is no justice except in Islam and under its law O Sheikh Al-Azhar, rather, the utter injustice for all human beings is the application of the capitalism of the Kaffir West, which is supported by the Vatican Pope. 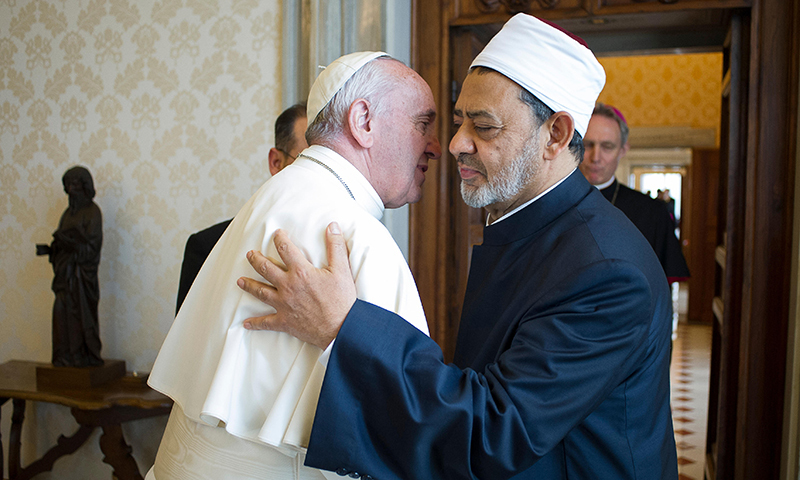 Then comes the document signed by the two parties and says: “We are the believers in God.” What God is this who your faith in him equates the faith of the Vatican Pope, O Sheikh Al-Azhar?! Wretched is the document and wretched are the signatories, the notaries and the witnesses to it, our faith is not equal to the faith of those who attribute to Allah a son and a wife! It is the same humanitarian slogans that France carried to the people of Algeria; the truth of which is an unprecedented hatred of Islam and its people. The heads of the resisting Muslims of Algeria are still embalmed in the museums of France. They did the same thing in Al-Azhar and the blood of Al-Azhar scholars is witness to them, is this humanity?! As for the four freedoms which the document spoke about, stating that freedom is every human being’s right of belief, thought, expression and practice, they are at the heart of the creed of secularism and its capitalist ideology, which sanctifies the four freedoms; freedom of belief, personal freedom, freedom of opinion and freedom of ownership, all of which are freedoms that Islam does not approve and does not accept in its totality. It is true that: لَا إِكْرَاهَ فِي الدِّينِ “There shall be no compulsion in [acceptance of] the religion.” [Al-Baqara: 256] and that the acceptance of Islam by force is not recognized, nevertheless it is not permissible for those who enter Islam to leave it. We do not have personal freedom in Islam, but all acts of the servants are restricted by the rulings of Islam, foremost in governance and politics. And there is no freedom of opinion, for our opinions revolve within the framework of Shari’ah and do not come out of it. مَا يَلْفِظُ مِنْ قَوْلٍ إِلَّا لَدَيْهِ رَقِيبٌ عَتِيدٌ “Man does not utter any word except that with him is an observer prepared [to record].” [Qaf: 18]. We do not own a property except on the basis of Shari’ah and the person is accountable before Allah (swt) of his money; from where he acquired it and on what he spent it. The freedoms of the West do not concern us, neither its document nor the dozens of documents that it makes its agents to sign them. What the Prophet ﷺ and his companions set cannot be changed by those who sold their world and Hereafter for a little of this world. This document is all contrary to the truth of your Deen so discard it, and know that your Deen has no clerics, no priesthood and no signatories on behalf of God, but we have scholars, jurists and narrator who are all human beings who do right and make mistakes, there is no sanctity for them, and the truth is not set by them, but the truth is known from its evidence in the Quran and Sunnah. Allah’s address on the obligation to comply with the Shari’ah, its application and conveying it, is an address for the whole Ummah; there is no difference between Arab and non-Arab, nor white or black. However, your representative in the application of Islam on you is the one who you will give your allegiance and the pledge of your hand to become a Khalifah to rule you by Islam in its state, the Khilafah Rashidah (righteous Caliphate) on the method of the Prophethood, soon, with Allah’s permission.